With a complete suite of cutting-edge technology solutions, Avadyne is transforming the patient financial experience from the first to the last point of interaction. Further cementing their position as a leader in the healthcare financial management space, Avadyne developed and launched a revolutionary Patient Concierge Augmented Reality App in 2018 which provides detailed explanations for bills to patients. 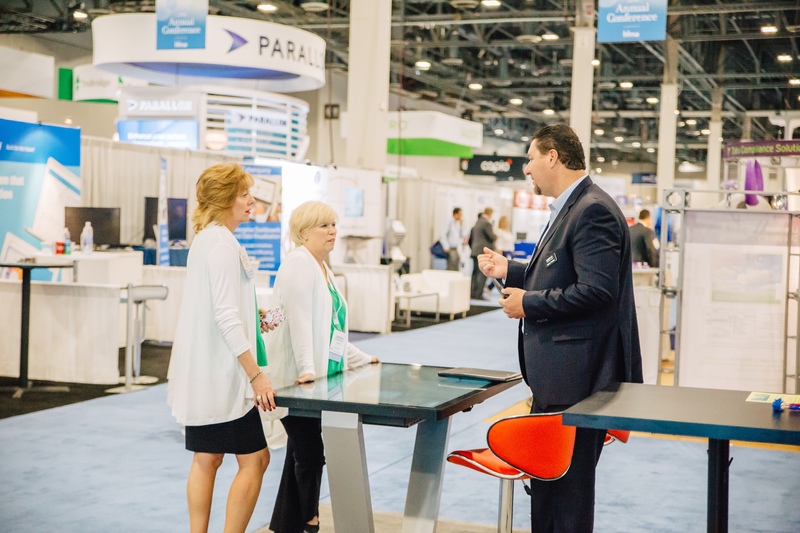 Healthcare Financial Management Association (HFMA) hosts an annual conference that attracts hospital leadership and vendors that provide services and solutions for hospitals. With their target audience gathered in one place, the HFMA conference was a chance for Avadyne to make a lasting impression and demonstrate their technological competencies. In order to stand out, Avadyne needed to deliver an experience on the conference floor that will catch attention, generate leads, and raise brand awareness. However, in 2018, there were 330 vendors vying for the attendees’ attention. This meant that Avadyne needed to go above and beyond to do what their competitors aren’t to craft memorable interactions. Avadyne Health partnered with SpinTouch to showcase their solutions with impact. After all, PowerPoint presentations and printed handouts were just not going to cut it on a competitive presentation floor. SpinTouch provided multiple interactive screens that allowed people to walk up to a display and engage with it in an intuitive way. Instead of receiving a rote presentation, visitors to the Avadyne booth could reach out and touch the information that was most pertinent to their situation. 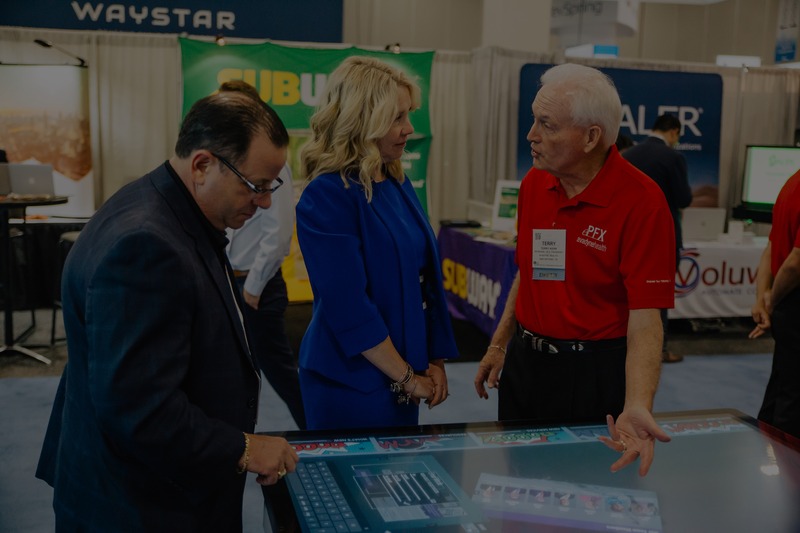 By giving visitors full control over the pace, depth, and content of their engagement, SpinTouch’s interactive displays allowed Avadyne representatives to provide fully customized conversations every time. Beyond the conference floor, SpinTouch also created the video that complements Avadyne’s Patient Concierge AR App. The Patient Concierge AR App featured an avatar named Eve who explained patient bills. By deploying CGI effects, SpinTouch was able to bring Eve out of the phone screen to explain her role and capabilities. 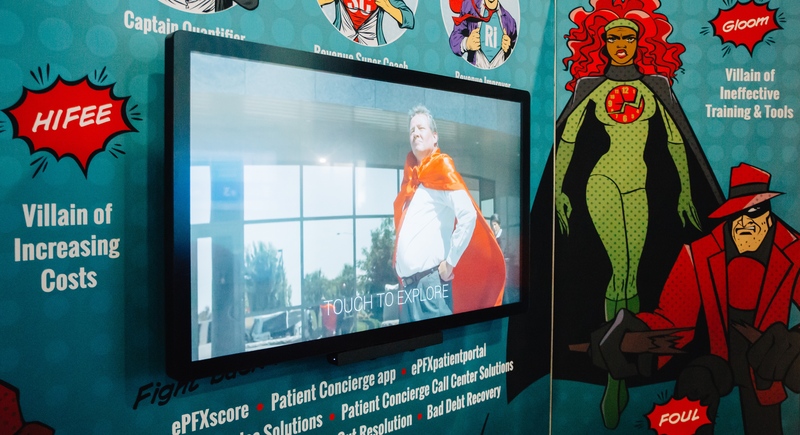 At the 2018 HFMA conference, Avadyne was able to get visitors to come up just out of curiosity for the dynamic displays installed at their booth. Equipped with interactive content at their fingertips, Avadyne representatives were able to lead their curiosities into thoughtful conversations that were personalized to match each visitor’s priorities, needs, and interests. In addition to increased foot traffic, Avadyne was also able to increase the credibility of their company as a technologically forward leader in the patient liability resolution space with an innovative interactive experience. By providing an elegant solution to the long-standing problem of static presentations, SpinTouch helped Avadyne articulate their mission and products with clarity and impact. We look forward to hearing about your project and sharing our knowledge and expertise. Let’s set up some time for a brief discovery call to dive and discuss your ideas and overall vision.